Us, The Girl Or The Shadow: Which Are You? As a preamble to the discussion of the film itself, I want to bring attention to the insane hype Us is gaining. It is making a killing at the box office, and I applaud Jordan Peele and his producers for a graceful release, and for gaining the momentum they have in order to get this many butts in seats for the opening weekend. It is particularly ideal that this movie is seen by so many Americans, as it poses the question of what it means to be an American in novel and unexpected ways. We open to the calm sound of ocean waves rolling in and out, and text that tells the audience about tunnels that run underneath the land upon which the contiguous United States sits. The message ends by informing viewers that the use of these varying types of tunnels is unknown. We are then indirectly introduced to our young protagonist, as she watches the television in what we can surmise is her childhood home. The TV tells us that the Hands Across America phenomena will be happening soon, and we are given a year stamp of 1986 to remind us when the national event happened. In case you came in late, the commercial also explains to all of the youngsters in the 2019 audience that Hands Across America was a fundraiser in the ’80s that asked Americans to come together, raise money for the hungry and poor, and just hold hands in an attempt perhaps to generate a feeling of connectedness. Some of the younger people who see Us might remember the song entitled “We Are The World” from one year prior. Even if you’re too young to remember the song, the music video may be familiar, as there have been countless references and comedic allusions to it throughout the years. Hands Across America had similar goals to this song: both were actually organized by the same group, USA for Africa. Hands Across America, however, obviously had more of a focus on Americans coming together for a better world and country. This introduction to the film is important, as it seems to be the main objective of the uprising which occurs throughout the film. There is far too much in this film to hone in on one focal point, which undoubtedly will lead some viewers to be frustrated or confused by it, not excluding myself. 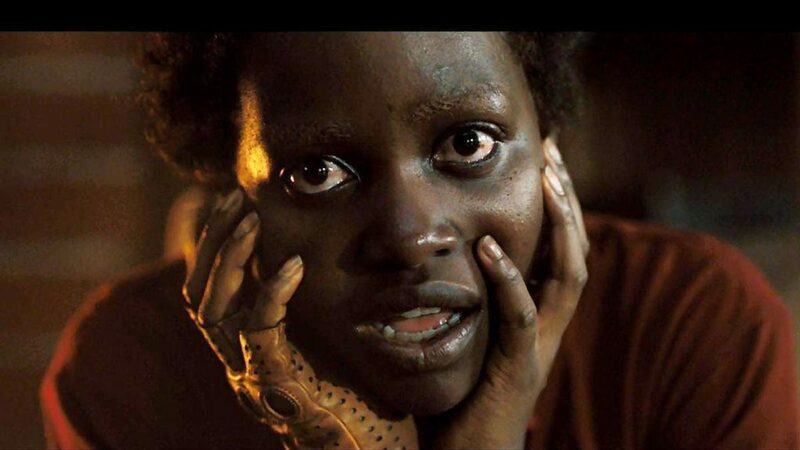 The film is not without jump scares, nor thrilling suspense, nor classic Jordan Peele humor, particularly doled out from the dad character, played ingeniously by Winston Duke. The cast in general, including Shahadi Wright Joseph and Evan Alex as the children, and Elisabeth Moss as the annoying and unmotherly foil to the main character, play their parts masterfully, but I would be remiss to not to praise Lupita Nyong’o and Madison Curry, who play Adelaide as adult and child respectively. Both command the screen and carry both their character and their character’s “shadow” simply and relatably, which I would say is the creepiest part of the film. There are many choices the filmmakers made that I walked away asking questions about, but one thing I understood, due to Curry and Nyong’o’s performances, was that the shadow characters, while certainly untamed, were not necessarily evil. They were people in different circumstances. Nyong’o gets to explain this in several scenes, and does so using a harmed vocal quality that begged the audience to squirm and expect the worst. Those of us who could listen past her hair-raising delivery heard the humanity beneath her exterior, and in the flashbacks and hallucinatory moments, Curry carries this juggling act between chilling delivery and humaneness with incredible sophistication. With this, we can investigate what Jordan Peele might be looking to get viewers to consider after seeing this movie. If the shadow characters of above-ground Americans are, in all of their murderous and extreme behavioral tendencies, just Americans, how do we differentiate between the two groups? And is it important to? Are these people the Americans who should have received the funds that the 1986 Hands Across America event raised? Or was the event to raise money perhaps to keep the insufficient accommodations of the underground quarters for the shadows? And how had Americans abandoned these underground “tethered” individuals for so long without anyone bringing an end to it? We can walk away from this movie either unhappy that the film did not tie up all of the loose concepts it began to address, or we can walk away trying to find our own answers to the question, “What does it mean to be an American?” Are we tethered to our fellow Americans who have less than we do? And if so, what can we do about that? It will start with acknowledging it. So, for raising the question, I salute the makers of Us.